One of the most incredible creatures is the whale. There are many species of the magnificent mammals, and the opportunity to see one up close is a unique experience. Many find that seeing whales in Baja is one of the easiest ways to have the chance to enjoy this type of adventure, and Mexican Insurance Store.com provides you with excellent coverage as you drive to your preferred whale watching destination. You’ll find they have a Mexican auto insurance policy which includes options that ensure your return home in the event of an incident or emergency and you can repair in multiple countries. A Mexican auto insurance policy is necessary because Mexico practices Napoleonic Law and without very good Mexican auto insurance policy coverage you can be detained in an at-fault auto accident. You can visit Mexican Insurance Store.com here. It’s particularly important to plan your whale watching in Baja trip so that you are there at a time that will enable you to actually view the creatures. The migration of the gray whale begins as early as November as the creatures begin to move out of the Bering Sea to head south toward the warm waters off the Baja coast. Their return trip in April after having mated and given birth concludes the optimum time for viewing whales in Mexico. Tourism mounts in the region from January through April as people venture to their favorite spots in hopes of catching a glimpse. There are several places on the Baja Peninsula that are especially well-known for whale viewing opportunities. Laguna San Ignacio, located in Baja California Sur, is known for its history in the whaling industry during the 1800s. 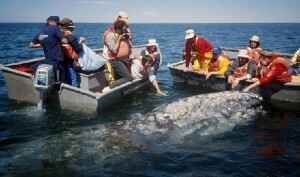 The gray whale was threatened with extinction because of the ruthless pursuit experienced in this area. Today, however, the region of San Ignacio Lagoon is a place for celebrating the magnificent creatures. Mating and birth of new calves can draw a large number of tourists, and many more important sea animals can be observed in the area as well. La Paz and Loreto provide not only the opportunity to observe whales in Baja, but also the chance to explore the aquatic beauty of the region through activities like snorkeling. The areas are easily reached by following the Transpeninsular Highway south. Some tourists travel all the way to the tip of Baja to view whales from Cabo San Lucas. There are many whale excursions available in these areas to provide up close viewing opportunities. For those with limited time for their whale watching expeditions, Ensenada provides a closer opportunity. The best time for seeing the creatures as they move south is from the latter part of December through early January as these are the times most of the gray whales are in the region. The beginning of the return trip to the Bering Sea is in late March, and you can view northbound progress through late April as the females conclude the yearly migration. Did you know a quality Mexican auto insurance policy from Mexican insurance Store.com allows you to repair in the U.S., unlike many border policies. While tourist packages are abundant in these spots, the individual who wants to explore on his own can choose a variety of beaches and coastal communities for Top Whale Watching Sites in Baja. While whale numbers may not be as concentrated as in the popular lagoons, it’s possible to observe occasional specimens from places along the coast of Baja. Timing is important, and it’s always wise to travel with appropriate levels of protection with a quality Mexican auto insurance policy. Do you buy Mexican Auto Insurance policy online when driving in Mexico? Yes, the Baja Peninsula is simply great for watching whales. Whale excursions are not to be missed as you can get a close glimpse of whales while enjoying the natural beauty of Baja. Previous post: Mexican Insurance Policy Facts and Info!